YMCA Under-12s’ unbeaten run came to an end as they went down to a 3-1 defeat to title rivals AFC Blackpool in the Poulton and District Primary League. League leaders AFC were in the ascendancy in the opening period and they led 2-1 at half time. But things didn’t improve for YMCA in the second half and the home side added a third goal to seal the points. Yash Passi bagged YMCA’s goal, while Kaiden Pirrie also put in a notable performance as YMCA succumbed to their first defeat of the season. Despite the defeat, YMCA are only three points behind their opponents with a game in hand to play. In the same age section, Foxhall Hoops produced a remarkable comeback to earn a point in a six-goal thriller Layton Blues. Layton bagged two first-half goals and added a third within two minutes of the second period. But with 15 minutes to go, Foxhall were awarded a penalty for a trip of Jack Lawson and he dusted himself off to casually slot home. Foxhall then dug deep to find a second as Lawson bagged his second of the game with a spectacular lob with just six minutes left. 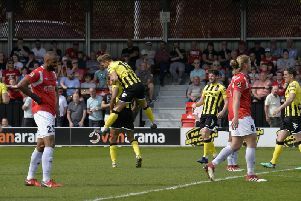 The whole team pressed forward and managed to pull level courtesy of Daniel Bruton, who scored his first league goal just a minute before the final whistle. The game ended 3-3, with Foxhall keeper Tom Warburton drawing praise from both teams for his efforts as he claimed the man of the match accoolade. YMCA U14s shared a point with Poulton FC in their Phase 2 match as they drew 1-1. Poulton, playing away from home, looked the brighter in the early stages and won the majority of loose balls while defending solidly. They deservedly took the lead after 15 minutes with an unstoppable shot from the edge of the area which found the top corner of the net. YMCA eventually came more into the game, with substitute Connah Trevelyan making an immediate impact, but his side still found it difficult to create any clear-cut chances. However just after the half-hour mark they found a breakthrough when a fine pass from Trevelyan found Jack Robinson, who turned sharply and drove the ball low into the far bottom corner from 15 yards. It remained 1-1 at the break and after the restart YMCA began to control the game with constant attacks. But a combination of missed chances and more resolute defending from Poulton kept them at bay, although good efforts from Jacob Grice, Lucas Miller and Ethan Goulding all went narrowly wide. The game was then delayed for a spell after a collision between Grice and the Poulton keeper Ewan Simpson resulted in the Poulton player requiring treatment from paramedics. On the resumption, YMCA were unable to find a winning goal. Grice and Trevelyan were both outstanding throughout for YMCA, who remain third in the league and Poulton in second (no match details from the Poulton side were available). Foxhall U15s secured an impressive 6-2 win against Layton Clarets, with three different players securing braces. It was a close game, however, with the result only decided in the last 15 minutes. Foxhall’s scorers were Jack Dunning (2), Lawrence Moore (2) and Reece Gaffikin. It was a quiet week in the Blackpool and District Youth League, with AllStars’ under-16 match of the week the only fixture played (see separate report in our football section). But the competition is due to expand next season, with the backing of the Lancashire FA. The intention is to run an Under-21 competition as well as an Under-18 league from September to help bridge the gap between youth and open age football and encourage young people not to drift away from the game. There are lots of reason why people stop playing competitive football in their mid-to-late late teens and the new structure is designed to keep players involved and to attract former players back to the sport. The BDYL is happy to help any such players to get in touch with a club if they are not already. The league would also like to hear from any managers and secretaries who are interested in getting involved at these levels. With this in mind, the league is to hold a meeting for managers and secretaries at Blackpool Cricket Club tomorrow at 7pm. A representative of the Lancashire FA will also be in attendance to offer advice and assistance and to discuss available funding. For more information contact the league at @bdyfl on Facebook or Twitter.